Re “The Voyage,” by Zachary Jason ’11 (Summer 2015): Jason did a wonderful job of capturing the energy of professor Jeffrey Bloechl’s course—the discipline of the daily walks, the regular reflections, the Masses celebrated by Anthony Corcoran, SJ, and the interactions with other walkers and with those who lived and worked along the Camino. I was struck by the questions raised and by the openness to a spiritual presence. 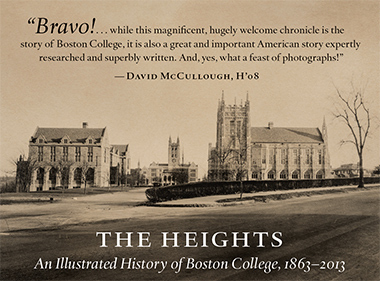 Re “Tidbits,” compiled by Samantha Costanzo ’15 and Alexandra Rae Hunt ’17 (Summer 2015): It was a pleasure to read excerpts from the Boston Globe‘s “Boston College Notes.” While conducting research for the University’s recently published history, The Heights: An Illustrated History of Boston College, 1863–2013, I found the “Notes” to be a delightful chronicle of the minutiae of daily life at Boston College in the late 19th century, minutiae that may have seemed commonplace at the time but have since assumed historical relevance. I’d like to share some “tidbits” not included in the article. The author is associate director of the University’s Institute for Advanced Jesuit Studies. After reading Robert Maryks’s “Assigned Viewing” (Summer 2015), about contrasting images of Jesuits in contemporary film, I wrote Professor Maryks to suggest Black Robe (1991), directed by Bruce Beresford, as a possible addition to his course. He replied that this film about 1630s Jesuit life in Canada was indeed included in his syllabus. Such offerings present fascinating opportunities to study the many faces of Jesuit activism since the mid-1500s. The article by Carolyn Freeman ’17 on things left in books (“Remaindered,” Summer 2015), was pure delight and more anthropological fun than I’ve had in a long time. Who even knew there was a book buried in the O’Neill stacks on “Japanese toys and the global imagination”? The author is a professor of political science. Re “Survey Says,” by Thomas Cooper (Summer 2015): I’m so glad the MCA&S survey on “the liberal arts experience” was created and shared. As an English and sociology major, I did much “What am I going to do with my life?” hand-wringing during senior year as I saw friends lining up jobs when I didn’t even know where to apply. Looking back, I am so thankful for the holistic education that the core curriculum provided. I love the suggestions of mandatory technology, finance, and business courses. And “career services focused on non-traditional fields?” YES! Technology now allows us to cobble together our passions into careers, and it appears more are headed in this direction. I’d also suggest offering classes that help students figure out what their dream is, as a precursor to helping them attain said dream. Re “Picture It,” by the Center for Retirement Research (Spring 2015): First, the study was funded by the Social Security Administration, which I consider a conflict of interest. Second, the article recommends working until 70, but mentions that the Social Security Administration can pay full benefits only until 2033. I am seriously considering taking early retirement at 62. My motto: They can pay you less for a longer period of time, or they can pay you more for a shorter period of time. But in the end they pay you about the same amount. I enjoyed reading about the crowdsourced studio Tongal (“Got Talent?,” by Steve Oney, Summer 2015), and especially about the company’s cofounders—James DeJulio ’97, Rob Salvatore ’97, and Mark Burrell ’97. The entrepreneurial spirit they possessed as undergraduates remains alive in their current efforts. As a liberal arts university, Boston College can lay claim to a robust entrepreneurial culture. To support this burgeoning interest, the Carroll School of Management has launched the Edmund H. Shea Jr. Center for Entrepreneurship. Its aim is to foster collaborations between students, faculty, and the entrepreneurial ecosystem of Boston and beyond. Tongal is one of many successful companies launched by Boston College alumni in the past decade. We expect to see the number grow with the availability of new resources provided by the Shea Center. Students will learn more about entrepreneurship in the classroom. They will see and interact with entrepreneurs who visit campus. They will get involved in startups through internships and other opportunities. And some will undoubtedly start companies, even before graduating. The author is executive director of the University’s Edmund H. Shea Jr. Center for Entrepreneurship. I enjoyed the tribute to the mathematics department (“The New Math”) in the Summer 2015 issue. I majored in mathematics at Boston College. The program then was quite different, but the spirit of excellence among the faculty was very much like that described in the article. This spirit, and the mathematics that I learned as an undergraduate, were perfect preparation for graduate school and a long career in mathematics and education. My work has kept bringing me back to Boston College connections: University of Chicago mathematician Paul Sally ’54, MA’56, and I worked together in the Chicago public schools, and now I’m working closely with department chair Sol Friedberg and colleagues in several professional development programs for math teachers. This is a distinguishing feature of many Boston College mathematicians—while tending to mathematics research at the highest level, they find ways to influence and enrich mathematics education across the country. It is surprising that the Ph.D. program in mathematics does not include (apparently) any field in math applications. Aren’t there more job opportunities in applied math than in pure math (e.g., in industry, government, even financial institutions)? In fact, would it not be beneficial to the Ph.D. graduates in pure math to have some background in applied math, just in case they fail to find desirable academic opportunities at some point in their careers? BCM brought Mr. Sarraga’s question to Sol Friedberg, chair of the mathematics department. His reply: “There are in fact many pure mathematicians contributing in industry, government and finance. The skills they develop are held in high regard and readily transfer—the top employer of number theorists in the country is the National Security Agency. Correction: “Digest” (Summer 2015) stated that the University’s new Welcome Week app had been launched by the Office of Student Services. The app was launched by the Division of Student Affairs.